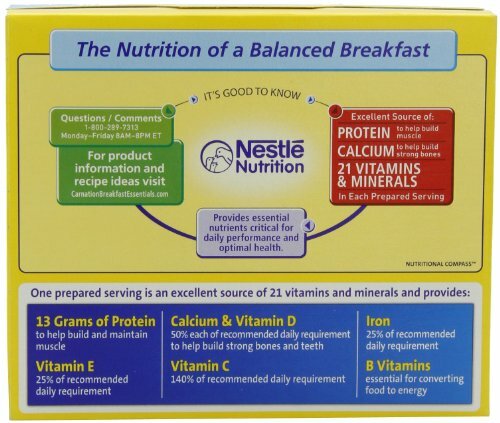 Home Amazon Carnation Breakfast Essentials Powder Drink Mix Stock UP Coupon Deal! Does your family drink Carnation Instant Breakfast Essentials? Hurry and get the Carnation Breakfast Essentials Powder Drink Mix, Rich Milk Chocolate, 1.26 oz, 10 Count Envelopes (Pack of 6) today for as low as $14.65 when you clip the big 30% off coupon and choose Subscribe & Save with at least 5 subscriptions from Amazon! That’s only $2.44 per box!! WHOA! Compare to $4.99 at Target or $4.44 at Walmart or $4.49 (on sale) at Kroger or $5.99 at Giant Eagle! This coupon is valid on different variations at different prices, but the best deal is on the rich chocolate flavor! See all the participating items here. You can only use the coupon on one product though. There is no commitment with Subscribe & Save. You can cancel at any time! Plus, get free shipping!! Details here! If you prefer one-time purchase, clip the coupon & pay $18.65 ($3.11/box). Amazon Prime members get FREE 2-day shipping!! If you are not a Prime member, get FREE shipping when you purchase $25 or more of eligible items across any product category. Check out the Carnation Breakfast Essentials Powder Drink Mix details below. Get up and Get Going with Carnation Breakfast Essentials. We know what it’s like to juggle the demands of career, family and a busy life. That’s why Carnation Breakfast Essentials offers the nutrition you and your family need to be your best throughout the day. Buy the Carnation Breakfast Essentials Powder Drink Mix, Rich Milk Chocolate, 1.26 oz, 10 Count Envelopes (Pack of 6) from Amazon. Previous articleTropicana Apple Juice Bottles, 24 Count – Coupon Deal!